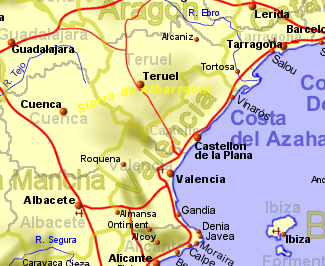 The Costa del Azahar or Orange Blossom Coast runs from just south of Valencia, north to near the Ebro Delta. It is a mainly flatish coastline, much of it being backed by orange groves and has some excellent beaches, popular with families. Gandia is the most southerly resort on the Costa del Azahar and has long stretches of fine sandy beach. Just south of Valencia is a large freshwater lake (the Albufera) which, though only a tenth of it's former size, is a haven for birdlife, and is surrounded by rice fields, Valencia of course being the home of paella. Valencia itself is Spain's third largest city and has many historic buildings plus an impressive modern Arts and Science Park (La Cuidad de las Artes y Ciencias) aimed at providing fun and learning. North of Valencia you will find Sagunto, a town rebuilt by the Romans after being burnt down. Many Roman ruins remain, including a restored amphitheatre where plays are performed during the summer months. Castellon, or Castellon de la Plana to give it it's full name has much of interest with plenty of bars, restaurants and beaches. Just north of Castellon is Benicassim, once famed for it's wine, but now developed as a tourist resort where some of the best beaches on the Costa del Azahar may be found. Towards the northern boundary of Valencia region are the towns of Peniscola, Benicarlo, and Vinaros with fine small beaches and restaurants.